Drinking water is something so basic and routine, we seldom think of the effect the practice may have on our dogs. 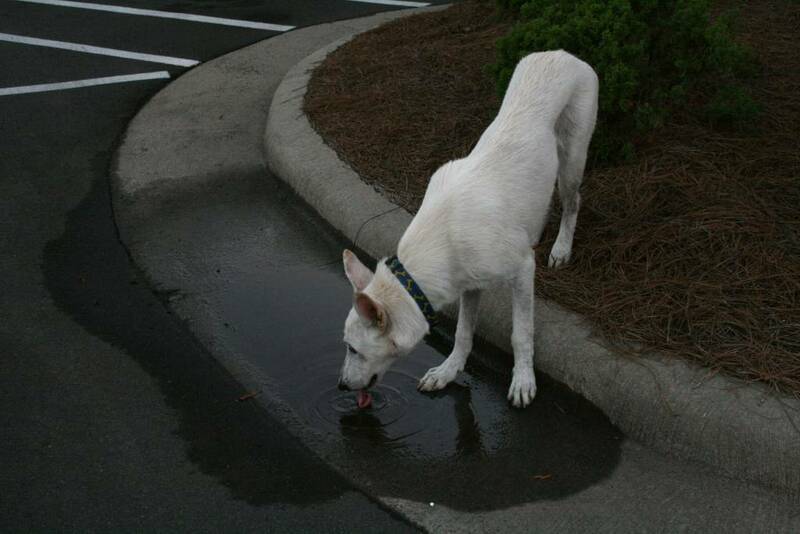 Drinking too much or too little water could result in some issues for your pooch. It could also be a sign of something even more harrowing. There are various factors that go into how much water your dog should be drinking on a daily basis, such as age, diet, level of activity, weather conditions, and size. This latter metric is arguably the biggest determining factor, and it provides owners with the clearest rule of thumb. Essentially, your dog should drink roughly 1 ounce of water per pound of body weight every day. While some dogs instinctively know how much water to consume daily, others do not. As such, it is very important to keep an eye on your dog to make sure he’s drinking the right amount of water every day. Doing so can yield healthy dividends for your pooch. Some serious health issues could develop if your dog isn’t drinking enough water every day. If he’s not drinking enough, problems like dehydration or problems relating to his urinary tract like kidney stones could develop. In some cases, serious issues such as organ failure could occur. There are a few steps you can take if your dog doesn’t drink as much as he should. Some of these steps are rooted in basic training strategies, such as praising him and offering treats when he does drink. Other steps may include enhancing the taste of the water by adding in packets of chicken, beef, or bacon flavor. Refraining from dry dog food is another terrific way to make sure your pooch is increasing his water intake. Canned, “wet” food typically consists of 70 to 80 percent water, which is significantly higher than dry dog food, which can consist of as little as 5 to 10 percent water. Making the switched to the canned stuff could be a nice, gradual introduction of more water to your dog, which may suit his disposition better. If your dog has gotten into the habit of drinking excessive amounts of water, it may not be because he likes the taste or he's very active. Rather, it could be an underlying symptom of a bladder infection. Sometimes, it could be an indicator of a much more serious problem, such as diabetes or Cushing’s disease. Considering the potential ramifications behind excessive drinking, it is important that you take your dog to a vet if excessive drinking remains a persistent problem. In the meantime, there are a few tactics you can deploy to control your dog's water consumption. A lot of these methods focus on the containers that dogs can use to drink their water from, such as automated water dispensers, rabbit water feeders, or "lick" bottles like they use for horses. The importance of proper water consumption relating to a dog's overall health isn't something to ever be taken lightly. Regular water consumption essentially makes it easier for a dog's body to function efficiently in many ways. Some of these ways may seem obvious while others are less so. For instance, it’s fairly obvious that water helps to keep a dog’s body temperature regulated and that it helps with digestion. But it also plays a key role in keeping a dog’s joints lubricated and comfortable. It also helps to regulate proper internal waste disposal. If your dog is not drinking the proper amount of water each day, all of these important functions can be thrown out of whack. If this imbalance happens, chaos great and small could occur. Keeping track of your dog’s water consumption is vital to preventing this imbalance from occurring. Even though there are a few are a few steps you can take to encourage balanced water consumption, it’s critical that you involve your veterinarian if under-drinking or over-drinking persists. Taking him to the vet could be the step that sets him on the path of wellness. It’s the least you can do for your buddy.